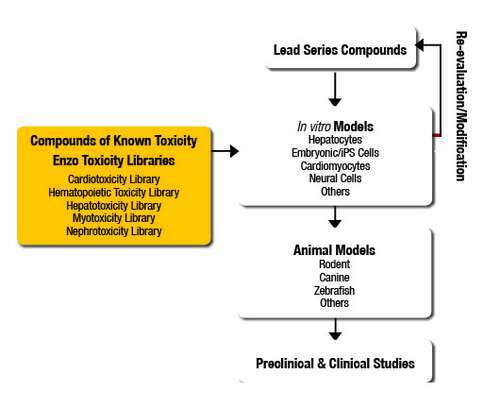 SCREEN-WELL® libraries from Enzo Life Sciences for nephrotoxicity, cardiotoxicity, hepatotoxicity, and hematopoietic toxicity contain compounds with defined and diverse organ-associated toxicity profiles. A variety of structurally and mechanistically different compound classes are included, as well as nontoxic controls. Compounds are dissolved in DMSO at 10mM and aliquoted into deep-well plates at 100 or 500μl per well. The libraries are useful for predictive toxicology screening, including high-content protocols using cell based assays for early safety assessment. Comparison of lead compound results with those from compounds of known toxicity allows early elimination of toxic candidates.